Four ships of the Royal Australian Navy arrived in Sri Lanka today (23) to participate in the Indo-Pacific Endeavour 2019 (IPE 19), Australia’s largest ever defence engagement with Sri Lanka. HMAS “Canberra” and HMAS “Newcastle” entered to the port of Colombo while HMAS “Success” and HMAS “Parramatta” entered to the port of Trincomalee. The ships were welcomed by the Sri Lanka Navy in accordance with naval traditions on their arrival. In view of strengthening the cooperation on maritime affairs in the Indian Ocean under the Indo-Pacific Endeavour, an Australian Task Force consisted of Army, Navy and Air Force personnel has arrived for this programme. Accordingly, humanitarian and disaster relief activities, Helicopter exchange operations, Maritime domain awareness activities, Tri Forces Band performance with Australian Defence Force Band and Sports events between Tri Forces personnel of both countries etc. are scheduled to be conducted during the whole programme. 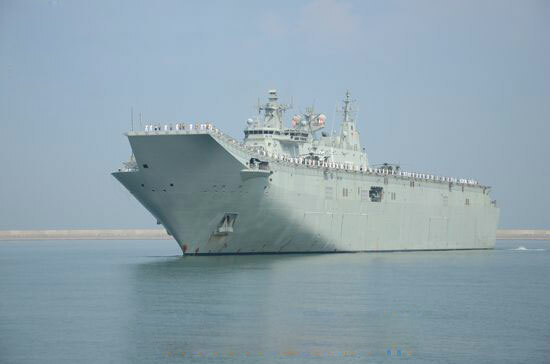 The two ships arrived at port of Colombo are HMAS “Canberra” and HMAS “Newcastle”. The 230.9m long and 7.9m wide HMAS “Canberra” which is commanded by Captain Ashley M Papp under the Flag Officer Air Commodore Richard Owen, has a displacement of 27500 tons and a crew of 483 officers and sailors onboard. HMAS “Newcastle” commanded by Commander Anita Sellick which has a displacement of 4200 tons and a crew of 205 officers and sailors onboard, is 138.1m long and 7.9m in width. Out of other two ships arrived at port of Trincomalee, HMAS “Success” which is commanded by Captain Darren G. Grogan, is 157.2m in length and 8.4m in width and has a displacement of 17900 tons with a crew of 178 officers and sailors onboard. HMAS “Parramatta” commanded by Commander T Van Tienhovan which has a displacement of 3900 tons and a crew of 190 officers and sailors onboard, is 118m long and 6.2m in width. HMAS “Success” and HMAS “Parramatta” are scheduled to set sail from the island on 27th March while HMAS “Canberra” and HMAS “Newcastle” are scheduled to depart Sri Lanka on 30th March, Sri Lanka Navy said.